Breakfast… my favourite meal of the day! I’m sure we all know the feeling when the alarm goes off and you’re nicely snug under the duvet, half in and out of a dream-like state with the sound of the rain softly tapping on the window… it takes something special to get out of a warm bed early in the morning but fear not, I have the perfect remedy that will make you jump up before the clock has even had time to wake you up! Overnight oats are a staple in my house, not only are they simple to make, they’re also super tasty and easily adaptable to other flavours. When you’ve mastered the basic recipe (and trust me, there’s not much to learn) then you can begin experimenting with adding extra ingredients such as grated apple and cinnamon, strawberry and vanilla, or pineapple and coconut if you’re feeling a little more tropical! The other great thing about overnight oats is that you can prepare portions in advance and they will keep stored in the fridge for 3-4 days, perfect if you want to make breakfast ahead of time and grab on your way to work. Making a homemade compote is another super easy way to become creative in the kitchen, and playing around with fruits and spices is all part of the fun. You can keep a jar stored in the fridge for 3-4 days, and layer through yogurt, top on porridge and even spread on toast… it’s that versatile. 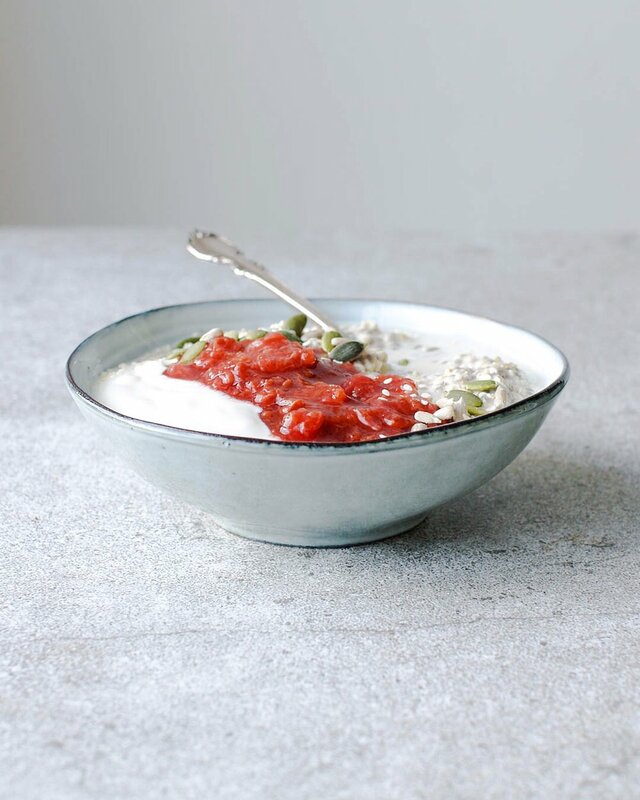 Below I share my favourite plum compote with a hint of vanilla and cinnamon, and it works deliciously with creamy overnight oats… if you give it a try, let me know what you think! Add the ingredients to a jar or bowl and stir together until mixed. Leave in the fridge overnight or for at least two hours. Remove the stones from the plums and chop into small bite size pieces. Add all of the ingredients to a pan and gently heat for 5-10 minutes, stirring occasionally. As the plums begin to soften, use the back of a spoon or fork and squish the plums until a compote begins to develop. Leave to cool in the pan and then transfer to a glass jar or an airtight container. The fun part… start layering up your breakfast! Add a spoonful of overnight oats to a jar, top with yogurt and then a spoonful of the plum compote. Keep going until your jar is full, top with a few frozen or fresh berries and a sprinkle of seeds.